"I've always had the feeling that the universe can still surprise us." Screen Media has debuted an official trailer for the indie drama Clara, which premiered at the Toronto and Sitges Film Festivals last year. This indie relationship drama is about a hard-headed astronomy named Dr. Isaac Bruno, played by Patrick J. Adams, who is searching for life out in the universe. One day he meets an impressive artist named Clara, and their connection changes him forever, leading them both on a profound discovery within the cosmos. Troian Bellisario co-stars as Clara, along with Will Bowes, Jennifer Dale, Ennis Esmer, Gabrielle Graham, and Kristen Hager. This film reminds me quite a bit of I Origins, but with an eye on the cosmos above all else. It's a smart, lovely, fascinating film that I would describe as an indie gem worth discovering. 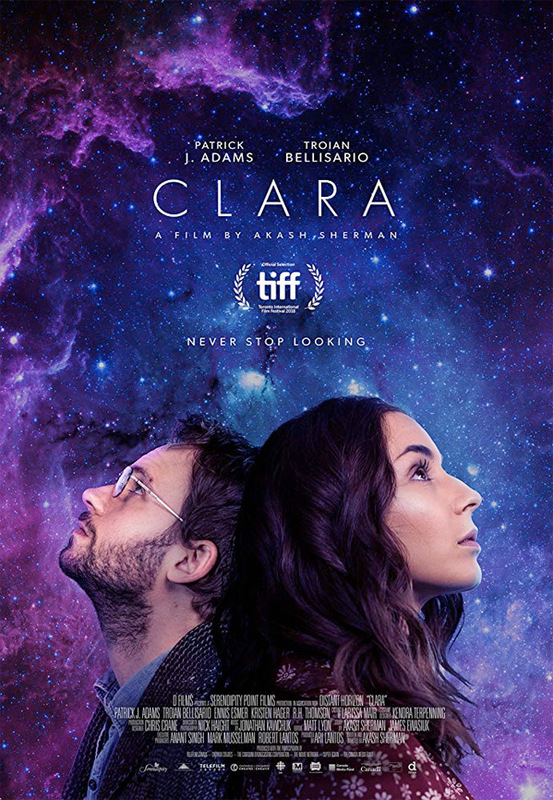 Clara tells the story of Isaac Bruno (Patrick J. Adams), an astronomer consumed by the search for life beyond Earth. Convinced that the universe is a dark and lonely place, Isaac one day meets Clara (Troian Bellisario), an artist who shares his fascination for the wonders of space. Their unlikely collaboration leads to a deep connection, and a possibly profound astronomical discovery. Clara is directed by Canadian filmmaker Akash Sherman, a former visual effects artist making his second feature film after The Rocket List previously. The screenplay is also written by Sherman, based on a story by Akash Sherman and James Ewasiuk. This premiered at the Toronto and Sitges Film Festivals last year. Screen Media Films will release Sherman's Clara in select US theaters + on VOD starting May 3rd coming next month. Who's interested?